Thanks mainly to Jonathan Marsden. 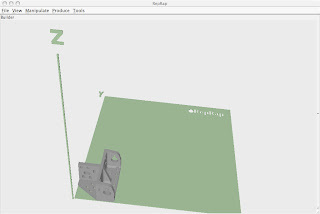 I'm proud to announce that we've released v0.8 of the RepRap Host software. This is a major milestone for us. Previously, installing and running the host software meant setting up a development environment and compiling the code. With this release, we have a cross-platform compiled .jar, ready to use out of the box. We have also switched to the rxtx library, which is a replacement for the java comms api. it is licensed much more nicely, is easier to install, and works great. This is a v0.8 release, due to the fact that there are still a few known bugs, most notably the fact that it crashes on large prints of 3d objects. Apparently its an easy fix, so if anyone is interested, please check out the source. We have automated the build process, so we can roll out your changes much easier now. Jonathan Marsden is our reluctant java hero, and he would love some help if you are willing. There are plenty of bugs large and small left to squash. Please download and run it, even if you don't have a RepRap machine. It can simulate the print process, so someone could work on the software without even having a machine!